Michael Benjamin Bay (born February 17, 1965) is an American filmmaker known for directing and producing big-budget, high-concept action films characterized by fast cutting, stylistic visuals and extensive use of special effects, including frequent depictions of explosions. The films he has produced and directed, which include Armageddon (1998), Pearl Harbor (2001) and the Transformers film series (2007–present), have grossed over US$7.8 billion worldwide, making him one of the most commercially successful directors in history. He is co-founder of commercial production house The Institute, a.k.a. The Institute for the Development of Enhanced Perceptual Awareness. He co-owns Platinum Dunes, a production house which has remade horror movies including The Texas Chainsaw Massacre (2003), The Amityville Horror (2005), The Hitcher (2007), Friday the 13th (2009) and A Nightmare on Elm Street (2010). Despite his commercial success at the box office, Bay's work is generally held in low esteem by film critics. While The Rock (1996) and Transformers (2007) received moderately positive reviews, his other films, including the four Transformers sequels, have been received negatively by critics. Michael Bay was born in Los Angeles. He was raised by his adoptive parents Harriet, a bookstore owner/child psychiatrist, and Jim, a Certified Public Accountant (CPA). Bay was raised Jewish. His grandfather was from Russia. His cousin, Susan Bay, is the widow of Star Trek actor Leonard Nimoy (whom he eventually cast as the voice actor for Sentinel Prime in Transformers: Dark of the Moon). He attended the exclusive Crossroads School, in Santa Monica, California. Bay often traces his interest in action films back to an incident during his childhood. As a boy, he attached some firecrackers to a toy train and filmed the ensuing fiery disaster with his mother's 8 millimeter camera. The fire department was called and he was grounded. Bay got his start in the film industry interning with George Lucas when he was fifteen, filing the storyboards for Raiders of the Lost Ark, which he thought was going to be terrible. His opinion changed after seeing it in the theater and he was so impressed by the experience that he decided to become a film director. He graduated from Wesleyan University in 1986, majoring in both English and Film. He was a member of the Psi Upsilon fraternity and a favorite student of film historian Jeanine Basinger. For his graduate work, he attended Art Center College of Design in Pasadena where he also studied film. Michael Bay began working at Propaganda Films, directing commercials and music videos, two weeks after finishing his post-graduate degree. His 90-second World War II-inspired Coca-Cola advertisement was picked up by Capitol Records. His first national commercial was for the Red Cross, which won a Clio Award in 1992. He directed Goodby, Silverstein & Partners "Got Milk?" advertisement campaign for the California Milk Processors Board in 1993, which also won a Grand Prix Clio Award for Commercial of the Year. Bay's success in music videos gained the attention of producers Jerry Bruckheimer and Don Simpson, who selected him to direct his first feature-length film, Bad Boys. The film was shot in Miami in 1994 and starred Will Smith and Martin Lawrence. The action film proved to be a break-out role for Smith, who was segueing from television to films at that time. Shooting in Miami was a good experience for Bay, who would later own a home in the city and spend a great deal of time there. The film was completed for $19 million and grossed a remarkable $141 million at the box office in the summer of 1995. Bay's success led to a strong partnership and friendship with Jerry Bruckheimer. His follow-up film, The Rock (1996), was an action movie set on Alcatraz Island, and in the San Francisco Bay area. It starred Sean Connery, Nicolas Cage and Ed Harris. It was also produced by Jerry Bruckheimer and Don Simpson, the latter of whom died five months before the film's release. The film is dedicated to him. Connery and Cage won 'Best On-Screen Duo' at the MTV Movie Awards in 1997 and the film was nominated for an Academy Award in the Best Achievement in Sound category for the work of Greg P. Russell, Kevin O'Connell, and Keith A. Wester. After the success of The Rock, Bay established his production company Bay Films, with a two-picture deal with Disney. In 1998, Bay collaborated with Jerry Bruckheimer again, this time as a co-producer, as well as directing the action-adventure film Armageddon. The film, about a group of tough oil drillers who are sent by NASA to deflect an asteroid away from a collision course with Earth, starred Bruce Willis, Billy Bob Thornton, Ben Affleck and Liv Tyler. It was nominated for 4 Oscars at the 71st Academy Awards including Best Sound, Best Visual Effects, Best Sound Editing, and Best Original Song. The film earned 9.6 million dollars on its opening day and a total of 36.5 million through the first weekend. The production budget, $140 million, was one of the highest of the summer of 1998. Armageddon went on to gross over $553 million worldwide, becoming the highest-grossing film of that year. In 2001, Bay directed Pearl Harbor. It starred Ben Affleck, Josh Hartnett, Kate Beckinsale and Cuba Gooding, Jr. The film was released on Memorial Day weekend in 2001. Again, Bay produced the film with Jerry Bruckheimer. The film received four Academy Award nominations, including Best Sound, Best Visual Effects, Best Sound Editing and Best Song. Again, Kevin O'Connell received another nomination for Best Sound, but he did not win. Pearl Harbor won in the category for Sound Editing, making it Bay's first (and, to date, only) film to win an Oscar. 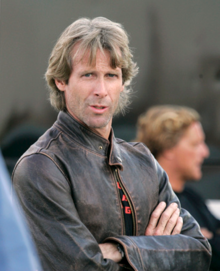 Michael Bay also directed the music video for nominated track "There You'll Be" by vocal artist Faith Hill. Bay reteamed with Will Smith and Martin Lawrence for Bad Boys II, a sequel which also marked Bay's fifth collaboration with Jerry Bruckheimer. The film grossed $138 million domestically, enough to cover the production budget, and $273 million worldwide, almost twice as much as the first movie. In 2005, Bay directed The Island, a science fiction film starring Ewan McGregor and Scarlett Johansson. It was the first film Bay made without Jerry Bruckheimer as a producer. The Island cost $126 million to produce and earned $36 million domestically and $127 million overseas making a worldwide total of $163 million. Bay stated that he was not comfortable with the domestic marketing campaign, as it confused the audience to the true subject of the film. In 2007, he directed and teamed up with Steven Spielberg to produce Transformers, a live action film based on the Transformers franchise. The film was released in the U.S. and Canada on July 3, 2007, with 8 p.m. preview screenings on July 2. The previews earned $8.8 million, and in its first day of general release it grossed $27.8 million, a record for Tuesday box office attendance. It broke the record held by Spider-Man 2 for the biggest July 4 gross, making $29 million. On its opening weekend, Transformers grossed $70.5 million, amounting to a $155.4 million opening week, giving it the record for the biggest opening week for a non-sequel. As of November 2007, the film has made over $319 million domestically and over $709 million worldwide. Bay returned as director and executive producer for Transformers: Revenge of the Fallen, which was released on June 24, 2009 and went on to gross over $832 million worldwide. Although it received mostly negative reviews by critics, including aggressively critical reviews by American film critics such as Roger Ebert, Michael Phillips and David Denby (who referred to Bay as "stunningly, almost viciously, untalented"), the film was well received by its intended audience and was one of the highest-grossing films of 2009. In 2010, it earned seven Golden Raspberry Award nominations and winning three: Worst Picture, Worst Director and Worst Screenplay. It was also one of the best selling DVD and Blu-ray Discs of 2009, second only to Twilight in DVD format and the number one of all time in Blu-ray format until it was surpassed by Blu-ray sales of James Cameron's Avatar in April 2010. Bay directed Transformers: Dark of the Moon, released on June 28, 2011. which went on to gross $1.123 billion globally. His next film was a comparatively small film he had been developing for years, called Pain & Gain. The true crime story, based on events described in a Miami New Times article written by Pete Collins, concerns a group of bumbling bodybuilders working together to commit a robbery. It starred Mark Wahlberg, Dwayne Johnson, Anthony Mackie, Tony Shalhoub and Ed Harris. Bay produced DreamWorks' I Am Number Four, based on a series of novels by Pittacus Lore published by HarperCollins Children's Books. D. J. Caruso (Eagle Eye, Disturbia) directed. A fourth Bay-directed Transformers movie, Transformers: Age of Extinction, was released in June 2014. Starring Mark Wahlberg, the film earned $1.1 billion at the global box office  On January 12, 2016, Paramount Pictures released 13 Hours, which Bay produced and directed, based on the 2012 Benghazi attack. While being the lowest-grossing film at the box office of Bay's career, it went on to massive DVD sales upon its digital release in May 2016, earning over $40 million in home video revenue. On May 23, 2017, Bay was honored with his own Hand and Footprint Ceremony at The TCL Chinese Theatre. His English Mastiff, Rebel, also put her paw in the cement with Bay. Bay founded production house Platinum Dunes with fellow producers Brad Fuller and Andrew Form in 2001. Bay and Wyndcrest Holdings, a Florida-based investment firm, acquired the digital effects company Digital Domain from James Cameron and Stan Winston in 1996, infusing the struggling business with a $50 million investment. Digital Domain considered an initial public offering in 2009 but ultimately withdrew the offer, because of the lack of interest. The company was sold to Galloping Horse in 2012. After leaving Propaganda Films, Bay and producer Scott Gardenhour, also formerly at Propaganda, formed The Institute for the Development of Enhanced Perceptual Awareness (now known as The Institute), to produce commercials and other projects. Through The Institute, Bay has directed and produced spots for Victoria's Secret, Lexus, Budweiser, Reebok, Mercedes-Benz, and Nike. One of his Victoria Secret ads was for the 2009 "A Thousand Fantasies" holiday campaign. Bay co-founded 451 Media Group with Doug Nunes (who serves as CEO), and with John and Anthony Gentile, who previously marketed brands such as Micronauts, Visionaries, Sky Dancers and the Power Glove. In 2015, the company announced an interactive publishing division to offer "augmented reality" content from printed graphic novels with digital video. The graphic novels employ Touchcode technology from T+ink (previously used in the Power Glove), in which ink used in the printing process unlocks access to exclusive content that is housed on the Machinima Network, which is transferred to users' touch-screen-enabled mobile devices when the printed books are touched to those devices. The company's premiere slate of graphic novels was unveiled at the October 2015 New York Comic-Con. The creators involved included Scott Rosenberg, Skip Woods, George Pelecanos, Mark Mallouk, Clay McLeod Chapman and Peter and Paul Williams. In June 2016, Bay joined The Rogue Initiative, a production studio and technology company, as a strategic advisor and stakeholder. The studio merges Hollywood production with interactive talent to generate story-driven content for games, mobile, virtual reality, mixed reality, television and feature film. As part of the partnership, Bay will develop and direct a multiplatform action-adventure game and cinematic VR experiences, based on an original IP conceived by him. Bay lives in Miami with his three English mastiffs, named for characters in his films. As a boy, he donated his Bar Mitzvah money to an animal shelter and often includes his English mastiff dogs in his films. Bonecrusher appeared as Mikaela's dog "Bones" in Transformers: Revenge of the Fallen. Mason, his first English mastiff, was named for John Patrick Mason, played by Sean Connery in The Rock. Bay previously had another dog, Mason, whose final appearance in a film was as Miles' dog in Transformers. Mason died during production of that film in March 2007. In 2016 Bay owned a $50 million Gulfstream G550 jet, as well as a Bentley, a Range Rover, an Escalade, a Ferrari, a Lamborghini and two Camaros from the Transformers franchise. Despite his box office success, Bay's work has been mostly poorly received by critics, and his name is often used pejoratively in art-house circles. Bay has responded to his critics, saying "I make movies for teenage boys. Oh, dear, what a crime." Besides being accused of making films that pander to a low demographic, critics and audiences have been critical of elements of Bay's filmmaking style such as the overuse of Dutch angles, rapid cutting, and cliché camerawork. Other elements include extreme patriotism, juvenile humor, excessive product placement, oversaturated orange and teal color grading, reusing footage from his previous films, his refusal to make thought-provoking films, and his preference of action and spectacle over story and characters. Another point of contention with Bay's films is his portrayal and use of offensive racial stereotypes as comedic relief; a notable example being the characters Skids and Mudflap in Transformers: Revenge of the Fallen. Bay has also been accused of heavily objectifying women in his films, with critics describing Bay's manner of filming actresses as lascivious and pornographic. He has also faced criticism for making sexist remarks and showing female characters in a stereotypical light. He came under fire for firing Megan Fox after she made comments about him mistreating her on the set of the Transformers films and compared him to Hitler and Napolean, and allegedly body-shaming Kate Beckinsale and being critical of her appearance during the making of Pearl Harbor. ^ "Monitor". Entertainment Weekly (1194). Feb 17, 2012. p. 26. ^ Curtis, Brian (2005-06-15). "The Bad Boy of Summer". Slate. The Slate Group. Retrieved 2010-07-03. ^ Schumacker, Patrick; Sobel, Ian (2009-06-23). "The Michael Bay Explosion Tournament". ScreenJunkies.com. Archived from the original on 2009-06-25. Retrieved 2010-07-03. ^ "Michael Bay Movie Box Office Results". www.boxofficemojo.com. ^ "The Institute". Archived from the original on 2010-11-16. Retrieved 2010-07-03. ^ Fleming, Michael (2008-01-29). "New Line Sets Up New 'Nightmare'". Variety. Reed Elsevier. Retrieved 2010-07-03. ^ "Michael Bay Biography (1965–)". FilmReference.com. Advameg, Inc. Retrieved 2010-07-03. ^ Abrams, Nathan (June 20, 2017). "The Secret Jewish History Of The Transformers". The Forward. Retrieved June 4, 2018. As the adopted son of Jim and Harriet Bay, Michael was raised in a Jewish household. ^ Nevo, Joab (April 23, 2014). "Michael Bay Transforms His Transformers". Jewish Business News. Retrieved June 4, 2018. ^ "Linkin Park Rocks Russian Transformers Premiere". Orange News. 2011-06-24. Retrieved 2011-07-13. ^ Carroll, Larry (2009-04-21). "Michael Bay Afraid to Offend Leonard Nimoy With Transformers Family Reunion Offer". MoviesBlog.MTV.com. MTV. Archived from the original on 2011-02-20. Retrieved 2010-07-03. ^ Boucher, Geoff (2009-05-24). "Michael Bay, master of the 'huge canvas'". Los Angeles Times. Sam Zell. Retrieved 2010-07-03. ^ Breznican, Anthony (2009-06-18). "'Transformers' blasts back: Another Michael Bay direct hit". USA Today. Gannett Company. Retrieved 2010-07-03. ^ Vary, Adam B. (2010-06-30). "Optimus Prime Time". Entertainment Weekly. Retrieved 2010-07-04. ^ Lauren, Nelson. "Biography". michaelbay.com. Archived from the original on 2008-05-31. Retrieved 2010-07-04. ^ Pomerantz, Dorothy (2009-06-22). "Michael Bay: Making Movies, Enemies and Money". Forbes. Forbes. p. 2. Retrieved 2010-07-03. ^ Basinger, Jeanine (1999-06-21). "Armageddon". The Criterion Collection. The Criterion Collection. Retrieved 2010-07-04. ^ a b c "Michael Bay- Biography". Yahoo! Movies. Retrieved June 17, 2013. ^ Hochman, David (1998-07-10). "Is Michael Bay the Devil?". Entertainment Weekly. Retrieved 2010-07-04. ^ "Shootout – Michael Bay". AMC TV. Archived from the original on 2010-06-22. Retrieved 2010-07-04. ^ "Got Milk? (Aaron Burr)". The Inspiration Room. 2009-05-15. Retrieved 2010-07-04. ^ Staff, The Playlist (2013-04-23). "The Best Commercials & Music Videos Of Michael Bay". IndieWire. Retrieved 2018-04-10. ^ Wilson, Stephanie (2008-09-05). "Behind the Camera". Haute Living. Seth Semilof. Archived from the original on 2011-10-05. Retrieved 2010-07-05. ^ "Martin Lawrence Says Bad Boys 3 is Real". Worst Previews.com. 2010-04-21. Retrieved 2010-07-05. ^ Simon, Alex (2008-02-28) [June 2001]. "Jerry Bruckheimer: The Hollywood Interview". reprinted by The Hollywood Interview.com (originally published by Venice Magazine). Nancy Martinez. Retrieved 2010-07-05. ^ Ascher-Walsh, Rebecca (1996-02-06). "Death of a Hollywood Bad Boy". Entertainment Weekly. Retrieved 2010-07-06. ^ "1997 MTV Movie Awards – Winners". MTV. 1997-06-10. Retrieved 2010-07-06. ^ "Nominees and Winners for the 69th Annual Academy Awards". The Academy of Motion Picture Arts and Sciences. 1997-03-24. Archived from the original on 2013-07-23. Retrieved 2010-07-06. ^ Henckel, Guido (February 1999). "DVD Review – Midas Touch of Destruction". DVD Review. Archived from the original on 2011-07-19. Retrieved 2010-07-09. ^ Grover, Ronald (2004-05-31). "Jerry Bruckheimer: Hollywood's Most Wanted". Businessweek – BW Online. McGraw-Hill. Retrieved 2010-07-09. ^ "Nominees & Winners for the 71st Academy Awards". The Academy of Motion Picture Arts & Sciences. 1999-03-21. Archived from the original on 2013-11-02. Retrieved 2010-07-09. ^ Gray, Brandon (1999-07-01). "Daily Box Office: Mild, Mild West". Box Office Mojo. Retrieved 2010-07-09. ^ "Armageddon (1998) – Box Office Mojo". 1998-10-11. Retrieved 2010-07-09. ^ "Nominees and Winners for the 74th Annual Academy Awards". The Academy of Motion Picture Arts and Sciences. 2002-05-24. Retrieved 2010-07-29. ^ Horn, John (2005-07-17). "You Call This Paradise?". The Los Angeles Times. Retrieved 2010-07-11. ^ "Transformers (2007) - Box Office Mojo". www.boxofficemojo.com. ^ "Transformers: Revenge of the Fallen". ^ Ebert, Roger (2010-06-23). "Reviews – Transformers 2: Revenge of the Fallen". Roger Ebert. Retrieved 2010-08-25. ^ Philips, Michael (2009-06-24). "And the popcorn transforms into earqplugs". Live!. Chicago Tribune. Retrieved 2010-08-25. ^ Denby, David (2009-07-06). "Tommy Guns and Toys". The New Yorker. Condé Nast Publications. Retrieved 2010-08-25. ^ Nusair, David (2009-06-26). "The AM Take". AskMen.com. Retrieved 2010-08-24. ^ Pols, Mary (2009-06-24). "Transformers: Revenge of the Fallen Falls Short". Time. Time Warner. Retrieved 2010-08-25. ^ "30th Annual Dis-Honors for Cinematic Dreck: RAZZIE Voters Spread the Loathe Around". Golden Raspberry Awards. 2010-03-06. Archived from the original on 2016-09-22. Retrieved 2010-08-31. ^ "Top-Selling DVDs of 2009". The Numbers. Nash Information Services, LLC. 2010-08-31. Retrieved 2010-08-31. ^ Drawbaugh, Ben (2010-10-29). "Transformers 2 tops chart, best selling Blu-ray of all time?". Engadget. Retrieved 2010-08-31. ^ Lawler, Richard (2010-04-26). "Avatar smashes Blu-ray sales records, has some owners ready to smash incompatible players". Engadget. Retrieved 2010-04-27. ^ Barr, Merrill (2010-01-09). "Transformers 3 Set for 2011 at The Film Stage". The Film Stage. Archived from the original on 2010-08-26. Retrieved 2010-09-02. ^ "Transformers: Dark of the Moon (2011) - Box Office Mojo". www.boxofficemojo.com. ^ Lauren, Nelson (2009-09-13). "Transformers 3, Pain & Gain, Bad Boys 3". michaelbay.com. Archived from the original on 2009-10-12. Retrieved 2010-06-16. ^ Collins, Pete (1999-12-23). "Pain & Gain". Miami New Times. Kevin Thornburg. Retrieved 2010-09-02. ^ Wigler, Josh. "'Transformers' Director Michael Bay On His Next Movie, Taylor Lautner And 'Bad Boys 3'". MTV News. ^ Kit, Borys (2010-01-20). ""Disturbia" director counts on "Four"". Reuters. Retrieved 2010-09-02. ^ Motoko, Rich (2009-07-01). "HarperCollins Buys Series From James Frey". The New York Times. Sulzberger family. Retrieved 2010-09-02. ^ 'Transformers 4' arriving in June 2014, CNN, February 14, 2012. ^ "Transformers: Age of Extinction (2014) - Box Office Mojo". www.boxofficemojo.com. ^ "Michael Bay's Benghazi Film Gets Trump Bump in Home Video". ^ Riley, Jenelle (2017-05-23). "Michael Bay Reflects on His Career as He Receives Hands and Feet Honor". Variety. Retrieved 2017-11-22. ^ Fuller, Brad (2009-12-21). "Platinum Dunes: The Official Site". Bloody Disgusting. Brad Miska and Tom Owen. Archived from the original on 2008-06-12. Retrieved 2010-09-13. ^ Com, Michael Bay Dot (9 December 2009). "Victoria's Secret "A Thousand Fantasies" (90 sec)" – via Vimeo. ^ McNary, Dave (August 25, 2015). "Michael Bay’s 451 Media Group Launching Interactive Publishing Arm". Variety. ^ Wickline, Dan (August 25, 2015). "Michael Bay’s 451 Media Group To Publish Hi-Tech Graphic Novels". Bleeding Cool. ^ Damore, Meagan (August 25, 2015). "Michael Bay's 451 Media Group Announces Interactive Graphic Novels". Comic Book Resources. ^ Kamen, Matt (August 26, 2015). "Michael Bay is launching a range of 'augmented reality comics'". Wired. ^ "VR explosions are en route as Michael Bay teams with The Rogue Initiative". 21 June 2016. ^ Diamond, Jamie (2003-07-17). "AT HOME WITH – Michael Bay – A Slam-Bang Master with a House of Om". The New York Times. The New York Times Company. Retrieved 2010-07-04. ^ Lauren, Nelson (2007-05-06). "Sunday Post". michaelbay.com. Archived from the original on 2009-01-06. Retrieved 2010-07-04. ^ "Mason Rock Bay". IMDb. Retrieved 2010-07-04. ^ Josh Eells (January 4, 2016). "13 Hours': Can Michael Bay Pull Off a Gritty Movie About Benghazi?". Rolling Stone. Retrieved March 10, 2016. ^ "13 Hours: The Secret Soldiers of Benghazi (2016) - Box Office Mojo". www.boxofficemojo.com. ^ "Transformers: The Last Knight (2017)". Box Office Mojo. Retrieved September 16, 2017. ^ a b D'Alessandro, Anthony (2018-03-07). "Michael Bay Lining Up 'Robopocalypse' & '6 Underground' As Next Projects". Deadline. Retrieved 2018-06-11. ^ Jr, Mike Fleming (2018-05-22). "Netflix, Michael Bay, Ryan Reynolds & Skydance Set Action Franchise 'Six Underground'". Deadline. Retrieved 2018-06-11. ^ Selcke, Dan (July 7, 2014). "Here's a learned analysis of why Michael Bay movies are bad, but pretty". The A.V. Club. Retrieved January 16, 2016. "No matter how many buildings, spacecrafts, and sentient robots Michael Bay explodes, the director can’t seem to get any respect. His movies are panned by critics, and his bombastic filmmaking style is routinely mocked by respectable, erudite writers on the Internet." ^ Curtis, Bryan (2005-06-15). "The Bad Boy of Summer: Michael Bay vs. his Critics." Slate.com. Retrieved 2014-07-25. ^ "'Transformers' Director Michael Bay Fends Off Racist Robot Criticism | Access Online". Access. June 24, 2009. Retrieved March 2, 2019. ^ Finn, Natalie (June 1, 2016). "Michael Bay's Chauvinist Reputation Remains Intact and No One Seems Less Concerned About That Than Michael Bay". E! Online. Retrieved March 2, 2019. ^ Buchanan, Kyle (June 26, 2014). "7 Ways to Tell You're a Woman in a Michael Bay Movie". www.vulture.com. Retrieved March 2, 2019. ^ "Rotten Tomatoes T-Meter Rating of Bad Boys". Rottentomatoes.com. Retrieved 2013-02-20. ^ "Rotten Tomatoes T-Meter Rating of The Rock". Rottentomatoes.com. Retrieved 2013-02-20. ^ "Rotten Tomatoes T-Meter Rating of Armageddon". Rottentomatoes.com. Retrieved 2013-02-20. ^ "Rotten Tomatoes T-Meter Rating of Pearl Harbor". Rottentomatoes.com. Retrieved 2013-02-20. ^ "Rotten Tomatoes T-Meter Rating of Bad Boys II". Rottentomatoes.com. Retrieved 2013-02-20. ^ "Rotten Tomatoes T-Meter Rating of The Island". Rottentomatoes.com. Retrieved 2013-02-20. ^ "Rotten Tomatoes T-Meter Rating of Transformers". Rottentomatoes.com. Retrieved 2013-02-20. ^ "Rotten Tomatoes T-Meter Rating of Transformers: Revenge of the Fallen". Rottentomatoes.com. Retrieved 2013-02-20. ^ "Rotten Tomatoes T-Meter Rating of Transformers: Dark of the Moon". Rottentomatoes.com. Retrieved 2013-02-20. ^ "Rotten Tomatoes T-Meter Rating of Pain & Gain". Rottentomatoes.com. Retrieved 2013-02-20. ^ "Transformers: Age of Extinction". Rotten Tomatoes. Retrieved 2014-08-04. ^ "13 Hours: The Secret Soldiers of Benghazi". Rotten Tomatoes. Retrieved 2016-01-19. ^ "Transformers: The Last Knight". Rotten Tomatoes. Retrieved 2017-06-20. Wikimedia Commons has media related to Michael Bay.